Junior Seau’s suicide is a reminder of how vulnerable the human mind can be. 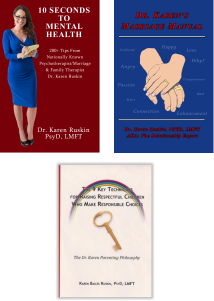 Today this psychotherapist and human behavior expert; Dr. Karen Ruskin, was interviewed on The Doug Meehan Show; 96.9 Boston Talks where I discussed this tragedy. Topics such as; why people commit suicide, warning signs, and what to do if you or someone you know is having suicidal thoughts was discussed. Suicide is a permanent solution to a temporary problem. Those who have suicidal thoughts typically have the perception that their future is hopeless and do not feel the problem is temporary. They are in so much pain that they feel the only way to end their pain is to end their life. Most people who commit suicide have a mental or emotional disorder. The most common underlying disorder is depression. Talk with the person about your concerns. Use great listening skills. Trust your gut. If you think that person is in trouble, he probably is. Do not promise not to tell anyone. For on demand listening to this informative interview click the play button below.